Today we’re tackling one of the most misunderstood, but vital, elements of writing fiction. 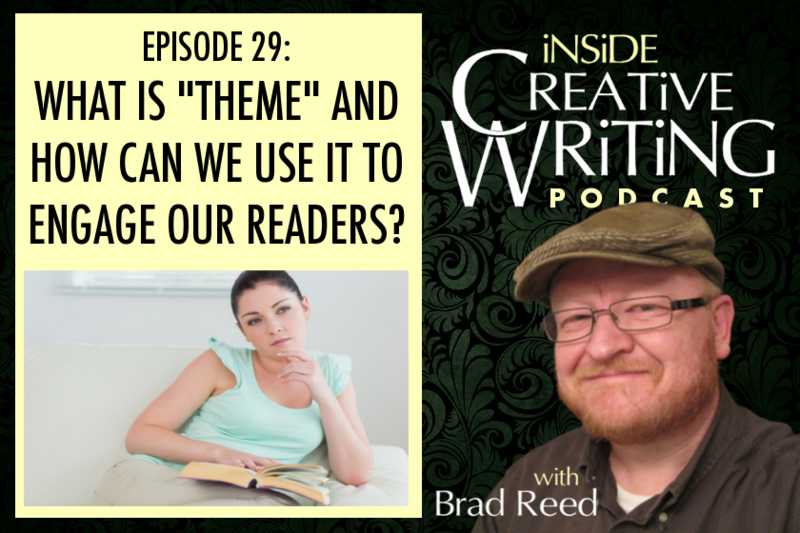 Today is all about “theme.” What is it, and how do we get it working our stories? Welcome back to the Inside Creative Writing Podcast! My name is Brad Reed and I’m really excited to be bringing today’s topic to you. It’s one of those things that might give you unpleasant flashbacks to that high school English class where the concept of “theme” was one of those elusive, confusing pieces of literature that never quite clicked for you. If that’s the case, you’re not alone. As a high school English teacher myself, I watch students come into my class with the same glassy-eyed hesitation when I start talking about theme. But, the good news is that they leave my class understanding what it is and why it’s so important in a piece of writing. We’re going to take it a step further today and go beyond just finally understanding what we’re talking about when we’re talking about theme and begin to explore how we can use theme to make our writing more relevant, powerful, and compelling for our readers. But before we dive into theme today, I want to mention that the Real-Time Revision Video that we uploaded on Thursday – that’s be video 24 in that series, I think – is all about theme. So if you find that, after today’s episode, you’d like to see how I identify and implement theme in my own writing, check out that video. It’s part of our free-to-everyone Patreon rewards and you can find it either on the podcast website (www.BradReedWrites.com) or on our Patreon page at www.Patreon.com/bradreedwrites. Again, we’ve made all of our resources over there free for everyone, whether or not you’re a Patreon team member. If you find value in what you find there, we simply ask that you consider throwing a few bucks a month our way to help keep the show up and running as part of the Patreon team. I also wanted to remind you about the opportunity you have to be a guest host of the podcast! I’ve talked to some of you about this and am finding something interesting–that a lot of you don’t feel like you have the expertise to submit a short audio segment for use on the show. Well, if that’s you, I want to dissuade you from that notion. We are all on our own unique journeys as writers. We all become experts in some things and remain novices in others. We all find techniques that really click for us and dismiss others that just don’t work with our writing style. This opportunity is really about just sharing what’s worked for you as a writer, regardless of what “level” of writing you are at. Basically, it works like this: Record yourself basically teaching an element or technique of writing that you are especially passionate about for about 15-20 minutes. This could be on your own or even with a partner. (Try to use a decent external microphone so the sound quality is good.) It’s basically just you sharing something that works for you that others might benefit from. Then send us an mp3 file to bradreed@bradreedwrites.com and you might hear your segment on the show. I’m thinking of it a little like the way talk shows used to work. When Johnny Carson went on vacation or had to miss a day of taping, they didn’t just run a rerun like talk shows do now. They had a guest host come on for the show instead. That’s kind of the model I’m looking for. You don’t have to worry about producing the show, doing an intro or outtro or Wise Words or Weekly Challenges (unless you want to). We’ll take care of all of that. It’s really just a chance to play host for a day and share what’s working for you with other writers. You could think of it like submitting a guest blog post only this is recorded audio. Just like any submission, there is no guarantee that we’ll end up using your audio on the show, althought we’re going to do our best to find a way to get all of them out there. Also, at least at this time, there is no compensation for audio segments, but you can feel free to mention your website, Twitter handle, books you currently have available, anything along those lines as long as promotion isn’t the focus of your segment. If you have questions, please don’t hesitate to email me. bradreed@bradreedwrites.com. Thanks for your insight, Jesse! You’ve hit on a technique I’ve never really thought to try. It makes sense since so much of what causes what we like to call writer’s block is a lack of confidence in our own skills. It makes sense that looking at writing that you consider to be inferior in some way, yet has still found success, might help to give us more confidence. I haven’t read Ready Player One–it’s been on my to-read list for awhile now but I just haven’t gotten to it–so I can’t comment on what I think of the writing, but it makes me think about something I heard a few weeks ago, and I apologize that I can’t place exactly where I heard it. They were basically saying that, if you have a good enough plot and your structure is solid, then readers can look past writing that is less-than-stellar. But if your plotting and structure aren’t good, no amount of good writing (sentence-level writing) will save your book. It’s about the story first and foremost. And I think that goes hand-in-hand with what Jesse is talking about here. Whatever it takes for us to get out of our perfectionist minds and into writing is a good thing! Thanks for sharing your thoughts, Jesse, and for your support of the show! If you have comments you’d like to get to us, and that we might use on a future episode, you can give us a call like Jesse did at 541-952-2406. Of all the things that English teachers teach, I think “theme” might be one of the hardest ones, and I’m actually not sure why that is. I think part of it is that there isn’t a clear agreement, even across teachers of English, what we mean by theme, but it also has to do with how many other ways we use the word theme. I mean, you could have a prom “theme” that is “Under the Sea” or “Night Beneath the Stars.” You could decorate your house with a country theme. You could even compose a theme song for a TV show. Or you can go to a theme park like Disneyland or Universal Studios or Sea World or Dollywood, for that matter, and theme just means the concept or idea that ties everything together. So how do these relate to themes that we either find, or want to create, in the books that we read and write? The first step, and the most important step, is in separating what we mean by “theme” in books and stories from what we mean by theme in all these other circumstances. I want you to divorce the word theme from all the other connotations when we’re using it to talk about writing. It means something different, and getting it all thrown in with the other uses of theme will only complicate what we’re trying to do here today. So, at least for now, forget that you’ve ever heard the word “theme” before. YOu’re staring with a blank slate and ready to give it some meaning. And to do that, we actually have to start with another word, but this one you already know. And that word is topic. Topic is simply a concept or a thing that is under discussion. It’s almost always one word, or maybe a phrase that sums up a single idea. Books will usually have a huge number of topics–things that it is talking about. For example, the book I’m writing right now is talking about earthquakes, survival, family, love, loss, religion, faith, trust, danger, hope, hopelessness, fear, and a bunch of other things. These are all topics, not themes. Let’s use Harry Potter as an example again. What are the topics of Harry Potter? Well, things like magic, friendship, education, good and evil, family, love, adventure, loneliness, and on and on. None of these things are themes, even though you might have been taught that they are. Forget all that nonsense. We already have a word for these things, and that word is TOPICS. Now, we’re going to use TOPICS to find THEME. And remember, at this point, you have no idea what we mean by theme, so keep an open mind, a blank slate. The creator of the Harry Potter story believes that friendship is…. What? Knowing the story, how would you fill in the rest of that sentence? I might say something like this: The creator of the Harry Potter stories believes that we need the help of our friends to overcome great challenges. You might come up with something different, but I think it’s clear that we could all come up with something, right? I mean the books and the films have a lot to say about the importance of friendships. So we’re almost there with theme. Now all we have to do is chop off the first part of our sentence: “The creator of the Harry Potter story believes that” and we’re left with our theme: We need the help of our friends to overcome great challenges. THAT is a theme. Notice that it’s not a single word or a single concept. It’s a statement of belief. Some people are tempted to call it a “moral” but I like to stay away from that word because it’s too loaded. It starts to sound like something that’s preachy and I’d rather think of it as a statement about one way to see the world. Now before we decide that that’s our theme, there are a couple of quick checks we can do to make sure we’ve identified it well. The first is to ask a simple question of your theme. Could someone argue against it? Let’s try it. Is it possible for someone to believe that we do NOT need the help of our friends to overcome great challenges? Absolutely. There are a lot of great stories–both true and fictional–about the importance of going it on your own and NOT relying on anyone else for the things you want. This is an important aspect of theme. It has to be arguable. This is one of the reasons a topic can’t work as a theme. Can you argue against the single word “friendship” or “war” or “love?” Well, not really. Not without bringing an opinion into it that isn’t actually there in the word itself. So that’s check number one: Is it arguable? Could someone reasonably disagree with the theme you’ve identified? Now to check number two: Can you back it up with evidence from the story. In other words, does the book or story REALLY say that? Taking Harry Potter for example, the books are filled with specific moments where, without the help of Ron and Hermione, Harry wouldn’t have been successful… or even survived for that matter! So yes, our theme stands up for Harry Potter. One, it’s arguable, and two, you can back it up with evidence. And here’s the thing. A book can have a huge number of themes. Virtually any topic you’ve identified could be extrapolated out into an effective theme as long as it’s arguable and can be backed up by evidence. Now, some of you already know how you’re wanting your reader to see their world differently after reading your story. You’ve already got your theme worked out, whether you kind of already knew how to use theme or just stumbled into it, which is very possible. Like I said, theme is there whether you intended it or not. The next step is to identify it, make sure it’s saying what you want it to say, and then intentionally weave it into your story so it doesn’t stick out like an example in an English textbook. We’ll pretend that you don’t have your theme figured out yet. That you’ve got a great story idea that you’re writing or are planning to write but haven’t really given any thought to theme. Well, start by doing the same analysis we just did with Harry Potter. Make a list: what are the topics of your story? List everything you can think of. If there’s a love story in it, write down LOVE. If there’s a war in your story, write WAR. If one character undermines another one, you might write TRUST. Make as big a list as you can. Then, start paring it down what really matters. Sure your story has a love interest, but it’s kind of subplot and not all that important, so you’ll cross out LOVE. And yeah, there’s one character that is always gaming the others, so trust is definitely a TOPIC but it’s not something I’m all that passionate about exploring, so I’ll strike through that one as well. Do that until you down to one or two or maybe three main topics. The real meat of what you’re dealing with. The heart of your story. For me, I came down to authenticity, faith, and family. Yours will almost certainly be different. Now start to write some theme statements like we did to identify theme earlier. The creator of this story (which is you of course, but I find that it helps to disassociate it from yourself for this step)… The creator of this story believes what about each topic, based on the evidence you see in the story. Write a few of these at least, and maybe a whole bunch more. Keep at it until you discover what it is you really actually want to say about the topic, about how it affects the world. This is the process that will lead you to your overarching theme. This is the answer to the “yeah, so what?” question that readers sometimes ask after finished even a good story that might lack a clear theme. This is hard, but fun, work, and you should give it as much time and thought as you need. Your story, if written well, will change the way people see the world. It will change the way they understand and relate to your topic. It’s worth your time to make sure that it is working the way you intend it to. So we’re skipping a big chunk of work here. We’re assuming you’ve done the work of identifying your overarching theme… the one topic that is most essential to your story and how you want your reader to come away from your story understanding it in a new way. Let’s move on to how to get it working in your story in a way that is subtle enough to not call attention to itself but is obvious enough that it “lands” with your reader. This is where some writers and educators disagree, so the best I can do is give you my own technique. I think theme is best expressed through characters who believe differently from each other about the theme. In other words, I very intentionally give each of my main characters an opposing view of the theme so that my readers can watch as each one approaches the world with their particular worldview and either succeeds or fails. Let’s start with a really simple example just to flesh this idea out. Pretend we’re writing a war story. So war is our topic. Not our theme, but our topic. Let’s say that it’s going to follow a group of soldiers who are tasked with an extremely dangerous mission behind enemy lines. We’ll set it in some future world where military service is no longer optional just so we can get as many perspectives involved as possible. After really thinking about what we want to say about war–themeatically–we come up with this: war is an effective way for boys to mature into men. Now, I’m not saying I agree with this theme… it’s just the one we’re working with for this story. So what I’m going to do with this story is make sure that I’ve stocked it with characters who have different takes on that theme. One or more of the characters will agree with the theme. Their in the military to improve themselves… to become men. I might even have an old grizzled captain who shares this world view. He’s not just there to win a war, he’s there to change boys into men. But then I want some characters who don’t operate with this world view. I want a character who absolutely opposes war, even though he is forced to fight it. He sees absolutely nothing redeeming about it at all and views it as the worst expressions of humanity, turning boys not into men but into heartless killing machines. And we’ll have another character who sees war entirely differently… as an opportunity for wealth. He’s consumed with pilfering things from their captives and is always looking for the angle to either make a buck or make a connection that will help him get rich after the war. Then you’ve got the peace-loving activist who sees it as his mission to redeem his comrades… to bring them around to his worldview. I think you see where I’m going here. Each character has a different take on the topic, and in doing that, we’ve created well-rounded characters that feel real to your reader. Rather than have the author come out and preach about their theme, your reader gets to watch all of these competing takes on the topic play out in the story world. From this point, you can make one of two choices in how your theme plays out. You can either validate your theme and invalidate the opposing ones, or you can use your story as an open-ended exploration of the theme. In other words, you could write your story so that the people who hold views opposing your intended theme fail in ways that show their beliefs to be wrong, or you could show the complexity of the theme, illustrating positives and negatives of all the various views. This is getting into some pretty deep water here that might be beyond what you’re ready to think about, but, in case you’re feeling good about the work we’ve done so far, I want to get into it a little more. My own opinion on this question is that it’s always better to leave some ambiguity about your theme. This is yet another opportunity for your reader to invest in your story and come away with the experience that they find most valuable. In some ways, I think the way we choose to go about exploring our theme is one of the main differences between what we might think of as genre fiction and literary fiction. Genre fiction for the most part–and yes I’m making sweeping generalizations here–has clearly defined themes that leave little room for alternative views. In superhero movies, for example, good triumphs over evil. We know who is who. We know who is right and who is wrong. In literary fiction, however, we are often left with an unclear theme. We’ve seen how complex a worldview is and how each take on the topic has these nuances of good and bad. As audience members, we are left trying to sort through the thematic elements of the story after the fact and we replay it over and over again in our minds to try to sort it out. What appears very complex from the audience perspective is actually pretty simple from the writer’s perspective. If you want a clear theme in your story where the audience leaves seeing the world the way you want them to, have your theme clearly be the “correct” take on your topic throughout your story. Have characters who disbelieve it suffer the consequences. But, if the point of your story is to leave your audience chewing on these nuances of theme, show them the complexity. Show them how your theme can be both redeeming and valid but also problematic and hurtful. Before we leave this topic for today, I fear we got a little into the weeds with it, so I want to end with a simple actionable technique. It’s a technique I usually save for revision since my first draft is really just about discovering who and what the story is about. It’s in revision that I’m putting in these nuances of theme and such. So here’s our nuts and bolts technique. First, discover your main theme. The one you really want to focus on. There will be other smaller themes that sneak in, but you want to have a main one in mind for this step. Once you’ve discovered your main theme, make a list of every opposing view you can think of for that theme. So if our theme from Harry Potter was that we need friends to overcome great challenges in life, we might list things like (1) we must be able to go it alone if we want to be truly successful in life, (2) fate drives our every action so it’s irrelevant that we have friends along with us… whatever is fated to happen is going to happen, (3) friends are a liability when you are trying to overcome great challenges because their needs and desires compete with yours… and so on. As many as you can think of. Then narrow it down to just the most poweful ones. The ones that you actually see in the world around you. So now you’ve got your theme and maybe four or five really compelling, valid arguments against it. THe next step is to make a list of every single character in your story. Even the small parts where they show up for just one scene and then disappear forever. Once you have them all listed, start brainstorming which view of the topic each character would hold from the list. Make some of them believe your actual theme, but have most of them believe in one of the others. It’s a great source of conflict for your story and a wonderful way to round out your characters and start discovering ways to imbue your dialogue and actions with subtext. I can honestly say that this exploration of theme has been one of the most powerful techniques I’ve used in crafting a story. You may have the greatest plot of all time, but if there’s nothing happening under the surface, if there are not great truths being argued about and illustrated in your readers’ minds, they’ll be left asking “so what?” at the end. Theme, as we now understand it, is the almost-magical element that makes your book matter, that makes it actually say something important and true and compelling. This is really what we’ve been talking about today with our discussion of theme. Theme is essentially the answer to a question that you, as a writer, are asking through your work. In fact, another great addition to identifying the theme you are incorporating into your work is coming up with an essential question that your theme is the answer to. What is the “big question” that you are exploring with your story? What’s truly great about books and films and all kinds of storytelling is that our audiences show up with their own questions as well. Theme provides us the opportunity to meet on the common ground of our story world and explore the answers together. Our challenge this week is not about writing your own story. Great writers must be great readers. And not just that. We must know how to “read like writers.” We have to read with an eye toward craft and technique. We have to be taking apart what the writer has done, why they’ve done it, and how effective it was. Think of it like a musician listening to a piece of music. Yes, they enjoy it and are awed by it, but they are also curious about how it works, how it’s put together. That’s the kind of reading we need to do as writers. So this week’s challenge is (1) to make sure you’re reading something. And (2) while you’re reading, be thinking about this concept of topics leading to them. Ask yourself as you read, what TOPICS is this book dealing with. You might even want to make a list as you discover them. Then see if you can turn one or two of them into a theme. What is the writer trying to get you to believe about the topic? Are they successful at it? Are they offering you an opportunity to explore the themes complexity or are they arguing for a more straightforward “this is right, this is wrong” approach? Paying attention to how other writers use themes in their work is perhaps the greatest teacher of how you can implement theme in your own. I’d love to hear how your exploration of theme in someone else’s work goes this week. You can let us know in a bunch of different ways by going to www.BradReedWrites.com and clicking the “Talk to Us” link you’ll find here.